Watercolours to learn more about wildlife and nature. It's easy to spot butterflies in the garden but not as easy to know what type of butterfly it is that was spotted. Once the British summer weather starts cooling and the butterflies gradually fade along with the season's warmth, a return to the nature journals and sketchbooks from the warmer days can provide fresh insight for drawing, painting and writing about the wildlife in and around the garden, local woods, fields and other green spaces. More information about nature can be gained through studying, researching and reading books and wildlife magazines, online wildlife blogs and other notes by wildlife nature writers and illustrators. Viewing specimens and looking at paintings can also be very useful for detail observations. 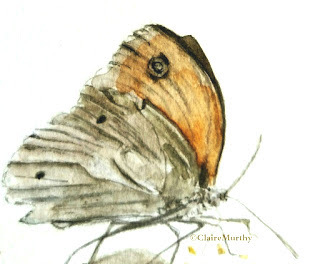 Wildlife Watercolour of a Butterfly from the Garden. This Meadow Brown butterfly might have been wrongly identified as a Gatekeeper butterfly. The latter is also known as the Hedge Brown and was once referred to as the Small Meadow Brown butterfly, on account of similarities. To make it even more challenging to identify a butterfly, regional differences in its markings and spots can vary widely. Painting a butterfly using watercolours (or any other medium) requires a certain amount of study, depending on how realistic the watercolour painting is to be; wildlife sketchbook studies in the field, wildlife photos for reference, detailed butterfly drawings, wildlife and bird anatomical research from books and the internet - are all ways to find out more about a wildlife animal, bird or creature to be painted. Even though this watercolour painted illustration was intentionally not very detailed, it was important to capture the two black spots on the under wings, as well as the tiny white centres on the black eyespots on the forewings, which were key features in its identification. Discover more about the wildlife subject to be painted. Gaining a deeper understanding and knowledge of the subject can lead to more realistic paintings of wildlife, including its habits and environments - drawing and painting wildlife is an enjoyable way to lean more about your subject!